This page features information on publications and reports sponsored by the Network of interest to scholars and the press. The Network has a unique partnership with Religion News Service. (http://www.religionnews.com/about/), an online news service that publishes stories on religion, spirituality and current events. NMRDC provides monthly stories and press releases to RNS that feature recent scholarly studies and forthcoming publications on Digital Religion. The aim is to increase public awareness of the unique research being undertaken in new media and religion studies, and translate these important findings to a popular audience. Stories are released simultaneously on the NMRDC blog and the RNS website. Heidi A. Campbell (editor), Digital Religion: Understanding Religious Practice in New Media Worlds, New York: Routledge, 2013. 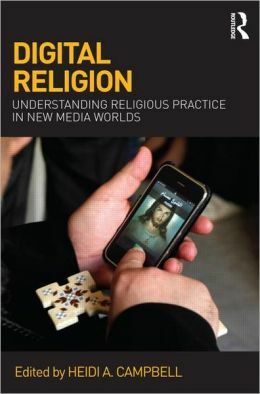 Digital Religion: Understanding Religious Practice in New Media Worlds offers a critical and systematic survey of the study of religion and new media. It features the work of key scholars in this emerging field, drawn from the advisory board and key members of the Network for New Media, Religion and Digital Culture Studies. It covers religious engagement with a wide range of digital media and highlights examples of new media engagement within the five major world religions. From cell phones and video games to blogs and Second Life, the book outlines how religious ritual, identity, community, authority and authenticity are negotiated and lived out online. Digital Religion is an invaluable introduction for scholars and students wanting to develop a deeper understanding of the field. Heidi A. Campbell & Gregory Price Grieve (editors), Playing with Religion in Digital Games, Bloomington: Indiana University Press, forthcoming 2014. Playing with Religion in Digital Games explores the increasingly complex relationship between gaming and global religious practices. It seeks to map key research questions such as, How does religion help organize the communities in MMORPGs such as World of Warcraft? What role has censorship played in localizing games like Actraiser in the western world? How do evangelical Christians react to violence, gore, and sexuality in some of the most popular games such as Mass Effect or Grand Theft Auto? 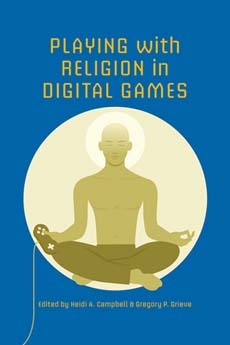 With contributions from a number of NMRDC scholars and gamers from all over the world, this collection offers a unique perspective to the intersections of religion and the virtual world. Wendi Bellar, Heidi A. Campbell, Kyong James Cho, Andrea Terry, Ruth Tsuria, Aya Yadlin-Segal and Jordan Ziemer (2013): “Reading Religion in internet Memes”, Journal of Religion, Media & Digital Culture, 2(2). This article provides a preliminary report of a study of religious-oriented internet memes and seeks to identify the common communication styles, interpretive practices and messages about religion communicated in this digital medium. These findings argue that memes provide an important sphere for investigating and understanding religious meaning-making online, which expresses key attributes of participatory culture and trends towards lived religion. The Routledge Studies in Religion and Digital Culture series is edited by Heidi A. Campbell, Gregory Price Grieve and Mia Lövheim seeks not only to document how religious groups respond to and interact with new media technologies, but also to uncover the deeper implications of these engagements. This series will further the work of the Network by bring together well‐crafted studies that investigate understudied themes related to the intersection of new media, religion and digital culture. We believe that emerging research needs to push for reflection on the social and institutional implications of practicing religion online and explore what impact, if any, this will have on the construction of identity, community, authority and authenticity in wider culture. New media technology and culture raise important ethical issues in need of investigation concerning authenticity, the boundaries of private, public and political, and the responsibilities of individuals and societies. Thus, the explorations of these issues by researchers of religion online call for increased cross‐disciplinary studies and scholarly dialogue.